oh Patty, I'm really fan, I couln'd say which one is the cutest. Que dulzura de niños y cuanta expresividad en sus caras y en sus posturas. Muy tierna la escena de estos niños. Todos se ven felices. Parece que Klara los cuida bien. Awwww They are just lovely Patty. I want to hold one of those little babies. You dress them perfectly every time. Of course your sculpting is FANTASTIC!!!!!!!!!!! I love them all. 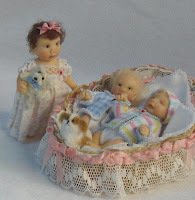 I love that photo, your dolls are adorable, I especially love the little baby looking at the camera! Hi Patty, indeed I think it was your wardrobe/cupboard. It is gorgeous! Now that I have seen it again, I like yours better. It is more ´alive´ I think and has a more used look. And I love your babies (as ever)! Thank you so much for all of the comments ladies!!! I love reading them! Klara, LOL That is too funny about your thought!! Lara, The woman who painted these was so good! She also had a blue,red and green one. I had the hardest time deciding which one I wanted. Now of course, I would love to also have a red one by her! It is a gorgeous scene. Klara seems to take her role seriously. I love teh jackets of the babies. Patty the scene is so sweet, Klara and the Babies are so expressive. Es una escena muy tierna patty. Hola otra vez!! Me ha tocado en el swap de Navidad mandarte los regalos, cuando vi que me habia tocado contigo me dió un buen susto porque con lo artista que tu eres, no se si estaré a la altura.Espero que te gusten. Mandame tu direccion y tu email para poder estar en contacto.